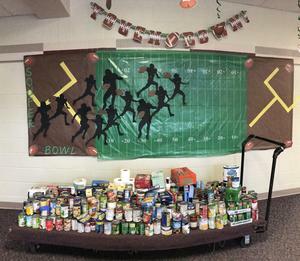 The NFL Superbowl isn't until February, but Alamo students have been having quite a competition of their own in their "Soup"er Bowl. This month, the Alamo Student Council organized a friendly competition between classes in the 2019 Souper Bowl, to collect cans and hygiene products for Christian Neighbors. At the end of two weeks, they've collected 489 items! The top three classes are now competing to see who wins a pizza party for the most donated! Stay tuned!